To the vast majority of the population, the link between the burning of fossil fuels and the alarming change in our planet’s climate is a no brainer. So much so that people’s action is creating an impediment to the otherwise unfettered expansion of the fossil fuel industry. Nonetheless, the investment into new fossil fuel projects continues. These types of projects are expensive, which require the supply of large amounts of capital. For them to go ahead, the companies involved must borrow this capital. Of course this is where the banks come in by lending the capital to the fossil fuel industry. It goes without saying that if the banks cease to lend money to the fossil fuel industry, this environmentally disastrous activity will go into decline. Back in 2015 the Paris climate agreement was signed which vowed to keep the increase in global temperature to less than 2oC above the pre-industrial temperature. Almost 200 countries signed this agreement and many companies around the world, including Australia’s big four banks were supportive of its goals. To the banks, it is a good look in the eye of the public to appear to be behind an issue that is near to the hearts of the people. 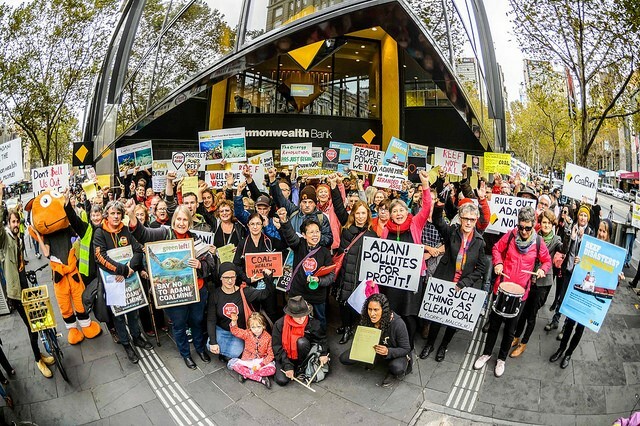 For example, back in 2017 the momentum behind the peoples’ anti-Adani coal mine actions made Westpac have a re-think about lending money to Adani - it refused to lend it money. Similarly 17 banks around the world have also refused to lend Adani money. This campaign by the Australian people to pressure the four big Australian banks not to lend money to the Adani project commenced in late 2014. By 2015 NAB indicated that it would not be lending money to Adani. Now all four big banks have made such statements . Whilst this one example is a great victory, and appears to be a step in the right direction, Australia’s big four banks continue to lend large amounts of money to other new fossil fuel projects and for the expansion of existing ones. This includes coal, oil and gas projects. Many of these are outside of Australia, so we do not get to hear too much about them, but they are extremely significant in terms of making the goal of the Paris climate change agreement unattainable. Fortunately, an entity known as “Market Forces”, which is an affiliate of Friends of The Earth Australia has carried out some good quality research into the role of the big four Australian banks in providing investment capital to these projects . This research indicates that since late 2015, the big four have actually increased their level of lending to the fossil fuel sector. The capital they have lent to projects which expand fossil fuel production is $3.89 billion. The breakdown for each bank is just over $1.3 billion each by ANZ and CBA followed by Westpac and NAB each lending over $500 million. These new projects will add another 4.9 billion tonnes of CO2 emission load to the planet over their lifetime. To put this into perspective, this is equivalent to cancelling out Australia’s 2021 – 2030 emissions reduction target by over five times. Many of these new projects relate to gas. Gas is often passed off as being a “clean” fuel in order to justify the expansion of its use. This is a furphy because the chemistry is the same - the combustion of one molecule of carbon in the form of gas (hydrocarbon) still produces one molecule of CO2. In the same period, the total capital lent by the big four banks to the fossil fuel industry covering all aspects of the sector’s activities is some $21 billion. Again ANZ and CBA lead in this dirty activity by lending over $7 billion each followed by Westpac and NAB each lending about $3 billion. As these figures illustrate, not only are the big four banks instrumental in the expansion of new fossil fuel projects, they play a vital role in propping up the existing fossil fuel sector. By contrast, in the same period they lent only $6.1 billion to renewable energy projects. Clearly, Australia’s big four banks are in shameful violation of their stated commitment to the goals of the Paris climate agreement. In fact they have placed the achievement of the crucial cap of less than 2oC increase in global temperature in jeopardy, endangering the future of our species. This is all in addition to the banks’ other shameful and abhorrent financial operations recently exposed by the Banking Royal Commission, which, let’s face it, only scratches the surface. So, the big banks have a lot to answer for. Peoples’ action has put a bit of a brake on the banks’ lending practices to the fossil fuel industry - these peoples’ actions are invaluable and must continue - however, under the system of capitalism the irreparable damage to the environment cannot be halted or reversed. Only by nationalising the banks and eventually serving the people under a system of socialism can the activities of the banks be channelled towards the effort of restoring the unity between humankind and nature in a sustainable manner.